The main focus of the conference was a vote during the House of Delegates meeting to enact a new unified national dues structure. Click here to read about the new structure, which was passed. NSPE Executive Director Mark Golden, CAE, FASAE, presented a year in review of all of the accomplishments that NSPE has made on behalf of licensed engineers over the past year. Click here for a summary. 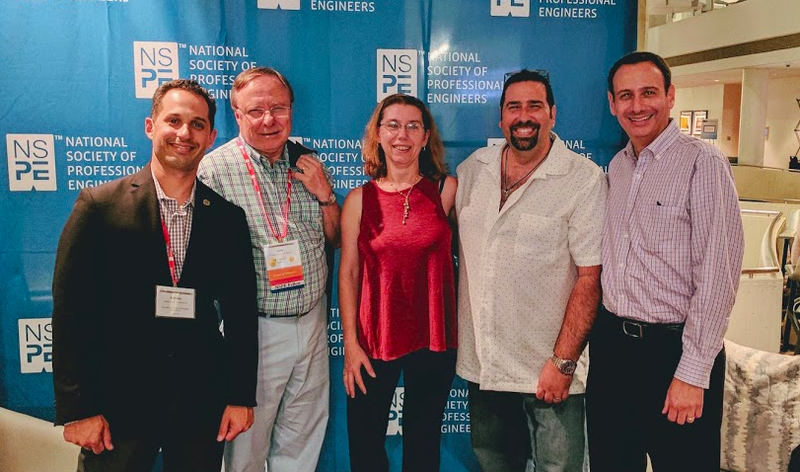 Andrew Yarmus, PE was inducted as the National Chair of Professional Engineers in Construction (PEC), a great honor that will allow Yarmus to have an impact on professional engineers in construction nationwide, and of course, represent New York on a national level. NYSSPE Executive Director Anthony Fasano, P.E. gave a presentation on leadership and represented NYSSPE in front of over 75 engineers in the sessions. Laura Pellizzi, PE, and Larry O’Connor, PE, F.NSPE, PLS represented New York at the Northeastern Regional meeting during which the northeastern states discussed issues pertinent to licensure. One of the biggest topics, of those that were discussed throughout the conference, was the threat to professional licensure that has recently occurred in approximately 21 States (click here to see map). This means that there were requests and/or considerations to eliminate professional licenses in these States. This poses a major threat to the PE license, as once one State eliminates one professional license, there could be a chain effect. NSPE has and will continue to be vigilant on this issue.